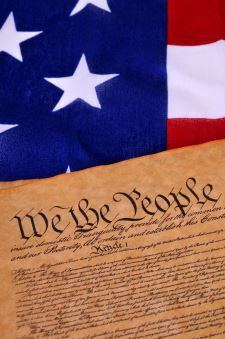 Today we celebrate the 227th anniversary of the U.S. Constitution and ask the question, “is the Constitution dead?” Has it survived despite the many years of degradation it has suffered or did it succumb long ago? The other day I was confronted with the idea that perhaps the Constitution is already null and void and has been for some time now based on the many unconstitutional acts of the federal government, some beginning as long as a hundred years ago. I’ll be the first to admit that much, perhaps even most of what the federal government does, is not allowed under the Constitution. But does that mean that the Constitution has failed, that it doesn’t work, that it is no longer valid, has become irrelevant and that we should quit contending for the founding principles of the American Constitutional republic? Or does it merely mean that we the people have ignorantly and foolishly elected persons who are now subjecting us to an unconstitutional, and therefore alien, form of government? I believe some people confuse conservatism with Constitutionalism and the conservative movement with the current efforts of Constitutionists. The two tend to be treated as synonymous and lumped together under one title. I admit that some who are called conservatives are Constitutionists, though not all, and Constitutionalism is what conservatism once was, or sought to be. However, Constitutionalism and modern conservatism are quite different entities. I contend that it is conservatism that has expired and lapsed into irrelevance while the principles of Constitutionalism remain ever relevant and worthy of our most valiant efforts to contend for. Conservatism began as an attempt to “conserve” or “preserve” our Constitutional form of government and its accompanying liberty. Conservatism also came to include endeavors to preserve the traditional Christian morals of our society. Conservatism has been failing for a half century now as everything that it sought to preserve has been continually slipping through the fingers of the Christian-conservative-right. With each defeat, the banner of conservatism moves a little to the left and finds itself planted on a new piece of ground from which it attempts to preserve the new state of affairs. Much of what is being called conservatism today would actually have been fought against by the founders of conservatism. If Barry Goldwater, the acknowledged founder of the conservative movement, were to come back from the dead, he would slap John Boehner and the Republican leaders silly and call them liberal, socialist traitors and enemies of the Constitution. It could easily be argued that conservatism is dead, or at least that the “new conservatism” is irrelevant, useless and not worth spending effort contending for. But what about Constitutionalism? If I may use an analogy to help us see the matter – let’s suppose that there is a small town of good, generally moral people, most of whom attend the town’s one church. There is no tavern in town and no vices are publicly practiced. One day a bar opens for business and the town’s people start getting drunk, including some of the church goers. The pastor starts a movement to “conserve” the morals of the community and preserve its current state. Over time, more and more people start hanging out at the bar until hardly anyone is left attending church. Then a nightclub with strippers opens up and the town’s people start leaving the bar and heading for the nightclub. So the preacher now moves out of his church and takes up residence at the bar where he begins pleading with people to “conserve” the current morals of the community by staying at the bar and not go to the nightclub. Next an opium den opens and… well, you get the picture, the cycle just keeps repeating. Has the preacher’s attempts to “conserve” the morals of the community failed? Quite obviously. However, has the Bible been defeated? Have it’s precepts been disproved as irrelevant and no longer worth contending for? Absolutely not! The Bible is still as relevant as the day the bar moved in to town. The Bible still holds the answers to all the troubles of the town’s people and is the cure for all the woes for which they seek to become intoxicated enough to be able to cope. The counsel of God’s word can still fix every problem they have. The Bible is totally relevant, totally applicable to their situation and its preaching and teaching in the community is needed now more than ever. The U.S. Constitution, as well as the Declaration of Independence and the Bill of Rights, are to the nation much like the Bible is to the church or to the individual. The Constitution, and the Biblically aligned principles that the founders based it upon, are still relevant, still right and still hold the answers for what ails government and society today. The Constitutional principles have not been defeated nor disproved any more than the Word of God has been defeated or disproved, they simply haven’t been practiced in awhile, and that to the detriment of society. Government may not currently be following the precepts of the Constitution, but the document and the principles upon which it was established are still true, are still sound, are still the law of the land and would still produce liberty, peace and prosperity if observed. Like with the Bible, it is when men are not following sound principles that those principles are in the greatest need of being taught, preached and proclaimed so that a wayward nation can find its way back by following the voice of the American founders crying out to us through our founding documents and through those who are still contending for the principles that they embody. Constitutionalism has not been defeated nor disproved, it simply hasn’t been practiced, but that doesn’t mean we should stop contending for it.